Some people were surprised, particularly Anthony Smith, when Jon Jones opened as a massive favorite over the light heavyweight contender for their UFC 235 headlining bout slated for March 2 in Las Vegas. Considered to be perhaps the greatest fighter of all time, it was no surprise that Jones would be a considerable favorite, but he opened at -500, which is a significant favorite in mixed martial arts. To put that in perspective, Jones opening at -500 means that you would have had to bet $500 on him to win $100 in prize money if he were to do as expected and defeat Smith. If that weren’t enough, the line on Jones quickly moved to -800. By comparison, if you were to place a bet on Smith, he was sitting at +500, meaning a $100 bet would net $500 in prize money. That is so yesterday’s news. Shortly after Strauss clicked the send button, the line moved again. As of mid-afternoon on Wednesday, money coming in on Jones pushed the line to -1100 on the UFC light heavyweight champion, while Smith dropped to +650. That’s a huge wager on Jones, though he has rarely looked vulnerable in the Octagon, but a huge opportunity if you believe Smith has a shot at upsetting the champ. 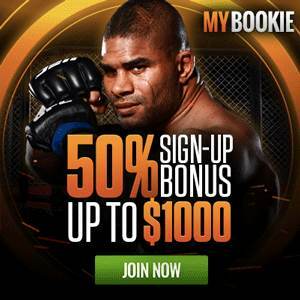 If you’d like to take a closer look at the UFC 235 lines and prop bets or any of the other MyBookie lines, be sure to use the promo code MMAWEEKLY if you sign up to get your 50-percent sign-up bonus.